Two German nationals, part of a group of anti-NATO protesters detained by police on Wednesday, asked for legal assistance Thursday in view of a possible suit against Romania over police brutality. The protesters were contacted by lawyers with two non-government organizations and they were taken official depositions on the events occurred Wednesday. “Our lawyers are trying to evaluate their chances to win a possible suit against Romania, considering what they have been through Wednesday. We cannot say for certain if they will sue Romania on their behalf,” an official with the Legal Resources Center in Bucharest said Thursday. 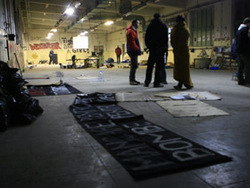 On Wednesday, Romanian security forces broke into a factory in Bucharest that has been rented by a group of anti-NATO protesters and took away 46 suspected activists for identity checks. Eight other people were picked up off the street and brought to police precincts together with the protesters. Romanian NGO “Solidarity for Freedom of Consciousness” on Thursday filed a legal complaint against Bucharest police and gendarmerie over abusive treatment of the anti-NATO protesters. However, an official with the Gendarmerie said the intervention of the security forces was triggered by the aggressive behavior of people inside the factory. The official said that some of the protesters even attacked police officers. “When seeing the gendarmes and police officers the protesters showed extreme violence, using tear gases in order to scare the officers,” said Marius Militaru, spokesperson with the Bucharest Gendarmerie.